Known affectionately around the world as the ‘Spice Islands’, Saint Vincent and the Grenadines is one of the most beautiful Caribbean Island nations. They are actually a chain of islands and are well known for their lush tropical rainforests, beautiful cascading waterfalls and areas of untouched and unspoiled natural beauty. The island chain is located in the Lesser Antilles in the Caribbean Sea. It consists of one main island called Saint Vincent and the northern two-thirds of the Grenadines cluster. The nation has a British colonial past and is now a part of the British Commonwealth. Agriculture in Saint Vincent and the Grenadines is dominated by the banana crop, which remains the most important sector of an essentially lower-middle income economy. Banana cropping employs 60% of the work force and accounts for 50% of the merchandise exports. The dependence on one crop is seen as the biggest obstacle to the development of this Caribbean island nation, especially since tropical storms could potentially wipe out large portion of crops. This dependence makes the economy very vulnerable to price fluctuations in the world banana market and changes in European Union trade preferences. The services sector is based principally on the growing tourism industry and is gaining in importance. Tourism has the potential for development and growth in the sector has stimulated activity in construction and improvement infrastructure. Tourism has now grown to become the chief earner of foreign exchange, attracting high-end yachting visitors and Caribbean real estate investors. In 1996, new cruise ship and ferry ports were opened to help increase the number of arrivals of overseas visitors. Attempts at introducing new industries have been largely unsuccessful, and high unemployment rates still continue. There are small manufacturing and offshore financial sectors. The currency is the Eastern Caribbean Dollar. The country is also a beneficiary of the U.S. Caribbean Basin Initiative. This means duty-free entry into the U.S. for many goods from here. Economic growth hinges on the seasonal variations in agriculture and tourism. The small offshore banking sector has made moves to adopt the international regulatory standards. St. Vincent real estate is easily available and largely affordable. Large villas start at around $600,000. Condos and apartment buildings can be found with a $350,000 starting price. Many visitors, vacationers and Caribbean real estate investors come to St. Vincent and the Grenadines to experience its unspoiled natural beauty. Few can bring themselves to leave this truly tropical paradise. There’s something for everyone on these Caribbean islands, from sailing to dolphin watching, from hiking to swimming in waterfalls. Travelers can climb the volcano, or explore underwater gardens around the archipelago. Six types of dolphin abound in the waters around Saint Vincent, including the Spinner, Spotted, Fraser and Bottlenose Dolphins. Orcas and Pilot Whales are also common. Numerous dive sites in the waters surrounding these islands are the perfect way to explore reef-life and the extraordinary variety of tropical fish. The shallow-water reefs are ideal for snorkeling. If you prefer land activities, you might want to go to Bequia, the largest of The Grenadines. There are various tours on offer like the Adventure Jeep Safari in custom-designed 4-wheel drive jeeps. You can visit the Old Hegg Turtle Sanctuary that is working to save endangered Hawksbill turtles from extinction. There are tours and guides available for hiking excursions along Bequia’s beaches, rural areas and the northeast of the island. The Leeward coast of the Caribbean Island of St. Vincent also has many interesting sights, like the Botanical Gardens with its rare exotic flowers, and plants. Bird watchers can see the Saint Vincent parrot and other birds in the Buccament Valley Vermont Nature Trails. This reserve has more than 35 species of birds in their natural habitat. Saint Vincent is often likened to a kite floating with the Grenadine islands, Bequia, Mustique, Canouan, Mayreau, Palm, Union and Petit St. Vincent, seeming like the kite’s tail. 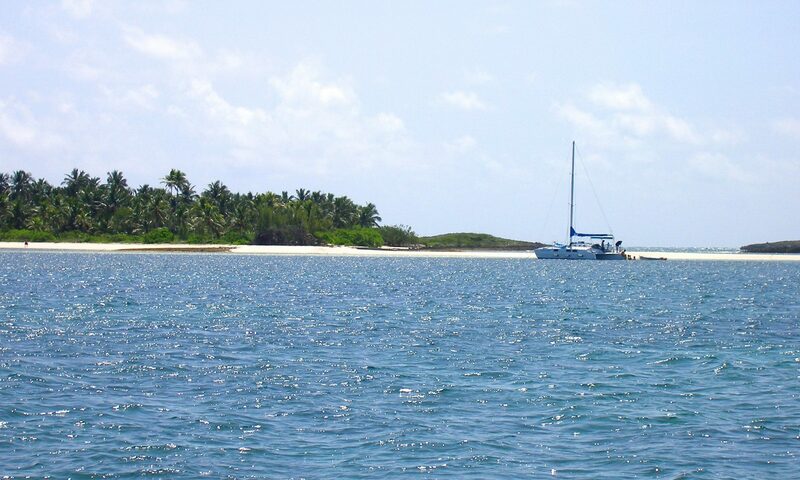 Between these inhabited islands are many deserted cays, interesting rocks and sand bar formations and lagoons teeming with colorful sea-life. Dive locations range from gentle, to the more difficult and exhilarating. Most are close, about a ten or fifteen-minute boat ride from the dive bases. Saint Vincent has a wide and eclectic range of options for eating out, from the beachside grills to simple, casual eateries to the fine gourmet cuisine. Hotel restaurants are open to non-residents and increase the choices. There is a wide range of local as well as international restaurants along Villa and Indian Bays. For a slightly more adventurous meal, you can drive out to Mount Pleasant or take a boat to Petit Byahaut or Young Island. Although St. Vincent does not have a wild nightlife scene, there are a few places offering evening entertainment. Many hotels have weekly live entertainment and local steel and string bands on Fridays and Saturdays. There are also a few nightclubs in Kingstown and in Villa. The islands have a thriving local music scene with Steel Pan players, Soca and Calypso singers, Drummers, Dancehall artists and Gospel singers among others. The weather is sunny and windy. The great weather is the main draw for Caribbean real estate investors and snowbirds from North America. Throughout the year, there is the possibility of occasional showers but these are typically very short. The prevailing tradewinds are Northeasterly and wind speeds are generally from 15 to 25km. For a while, after Christmas, the winds pick up to about 20 to 30km and the phenomenon is called Christmas winds. This can be any time in either January or February. There is not much seasonal variation in the temperature and it stays generally around the average 86° F. There are two official seasons, the rainy season and the dry season, and the dry season lasts from November until June. There are possibilities of hurricanes in the wet season, but there is always plenty of warning when a hurricane is approaching and travelers generally know about it at least three days in advance. Luckily, Saint Vincent and the Grenadines is at the very Southern edge of the hurricane belt, and has seen no direct hits from a tropical storm since 1955. Saint Vincent and the Grenadines are Caribbean islands lying between Saint Lucia and Grenada and part of the Windward Islands of the arc of islands in the Caribbean Sea known as the Lesser Antilles. Located due east of the Caribbean Island of Barbados and to the north of Trinidad and Tobago, the islands of Saint Vincent and the Grenadines are between the Caribbean Sea and the North Atlantic Ocean. They fall in the Central Americas and include the main island of Saint Vincent along with the northern two-thirds of the Grenadines, which are a chain of small islands lying in a southerly direction from Saint Vincent to Grenada. They are at 3° 15″ North and 61° 12″ West in the eastern quadrant of the Caribbean Sea. There are no direct flights to St. Vincent and the Grenadines, due to the topography and lack of a large airport. Travelers wishing to visit must fly into one of the neighboring islands, such as Barbados, St. Lucia, Martinique or Greneda and fly in via turboprop. Taxis are plentiful and the government fixes the rates for fares, but the taxis don’t have meters and you should check before setting off to avoid hassles later. Fares are higher late at night or very early in the morning. Tipping is discretionary and around 10% of the fare. Driving is on the left and road signs limited, but the locals are helpful and will generally point you in the right direction. A temporary driver’s license will cost around EC$50, and can be bought at the police station on Bay Street, or at the Licensing Authority situated on Halifax Street. You will need to produce a valid overseas driver’s license. If you have an International license, you will have to simply get it stamped at the central police station and you are OK to drive. You can also travel locally by bus. Colorful and wildly painted buses ply the principal roads of the main island and link all major towns and villages. Minibuses will stop on demand and run between Kingstown and the hotel areas of the popular Indian Bay and Villa. There are also a limited number of vans starting from Kingstown and going up to Owia or Fancy in the north of the island. Four motorized vessels make up the scheduled inter-island ferry service. You should arrive at least 15 minutes before the scheduled departure time. And remember that the schedule can vary depending on weather and other local conditions. A 7% Government Tax is usually included in restaurant bills and some places add an extra 10% service charge. All major credit cards are generally accepted, as well as U.S. dollars and travelers checks.